"RIPLEY walks tall and carries a very big stick." Oh how I would�ve enjoyed being a fly on the wall when studio executives decided that the world was ready for a sequel to the 1983 techno-thriller classic War Games. It�s good to know, however, that the whole internet community shared my sentiment of disbelief when the first trailer hit the web for War Games: The Dead Code. After all, what is the point of making a sequel to a decades old film that continues the story only in the most marginal sense? So here we are, 25 years after the release of John Badham�s minor classic, with new characters going through the motions of a story that�s just a little too familiar. Our lead this time is computer genius Will Farmer (Matt Lanter). Desperate to make some quick money, he engages a mysterious computer program called RIPLEY, a high-tech government computer masquerading as an online video game. RIPLEY is designed to identify and eliminate all worldwide terrorist cells, and when Will excels at the video game he quickly finds himself public enemy number one in the eyes of the supercomputer. Pursued by government agents, Will and his potential girlfriend Annie (Amanda Walsh) find themselves dogged at every turn while on a class trip to Montreal. Determined to clear his name, Will must rely on his hacker skills to stay one step ahead of the deadly computer that�s got his number. I have fond memories of the original, and while I haven�t seen it in twenty years (that anniversary DVD is mighty tempting, though) so much of its story came flooding back to me while watching this sequel. The Dead Code recycles numerous elements from its predecessor, growing more and more familiar as the film wares on. By the time we reach the climax, WarGames 2 teeters on the brink of becoming a full-blown remake of the first. And that�s the biggest problem here群there�s virtually no reason to recommend it, as the original is superior in every fashion (with the exception of obviously dated technology). That said, The Dead Code is a fairly competent little techno thriller. Matt Lanter is a likeable enough lead with some enjoyable chemistry with romantic-interest Amanda Walsh. Director Stuart Gillard keeps the stale plotline lively and the pacing lightning quick, so much so that you won�t have time to process all of the ridiculous coincidences jammed into Randal Badat�s teleplay. It�s been my experience that direct-to-video sequels usually aren�t worth the disc they�re pressed on, but The Dead Code is worth a look on a slow and rainy weekend afternoon. It�s not exactly memorable, but I�d by lying if I said I didn�t find myself consistently entertained. Image Transfer Review: There is no way that this screener copy can be indicative of the final release. Like the screener if received for Fox's Meet the Spartans, this is a mess. Digital artifacting in 2008? Yep, I'm afraid so. That said, the compression debacle isn't apparent throughout the entire film (unlike the Spartans screener, which was all but unwatchable). Still, it's far from a stellar transfer. I have a feeling that the retail product won't look as sloppy as this (if so, shame on you Fox), but the image quality of this screener is just too distracting for anyone with a large screen TV. Audio Transfer Review: The 5.1 Dolby Digital track fares much better than the image on this screener. The rear channels do a nice job of simulating a theatrical experience (your only shot at seeing this sequel in theater-like conditions) with lively explosions, gunfire, and general background noise. Dialogue is rendered crisp and clear through the main speakers and never get lost in the commotion. Extras Review: The audio commentary, a stagnant conversation between director and star, is a disappointment. Discussion tends to be far too descriptive of what's happening on the screen with a few dry asides here and there. Our two participants seem like they enjoyed making the film, but you get little sense of that here. The "making of" runs just shy of fifteen minutes and is little more than a lame promotional piece. You get a lot of production footage but little else. Rounding out the extras is a small collection of production stills. 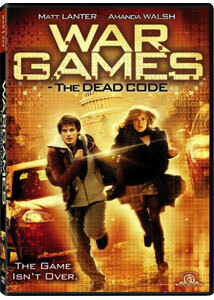 WarGames: The Dead Code may not warrant a purchase for anyone but the most devoted fan of this now-franchise. It's a decent little movie, far better than the usual direct-to-DVD filth that often litters the digital wasteland. Take this one in the right frame of mind and I think you'll be pleasantly surprised.